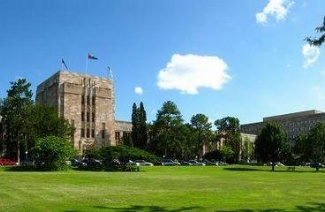 John Curtin College of the Arts is named after one of Australia's greatest Prime Ministers. The site on which the college is built was used in many ways prior to the construction of buildings in the 1950s. The first significant use of the site was by the Nyungar people who lived near the Swan River before European Settlement. The limestone hill featured in the story of the Wagyl, and it is also believed that the hill was used to observe movement along the bush tracks leading south. Fremantle's first official cemetery was on land that is now the college oval. The cemetery was established in 1852 and used until 1899 when it was decommissioned. It subsequently fell into disrepair. During the 1930s all intact headstones were transferred to the present cemetery in Carrington Street. Families were required to pay for the removal and reburial of their relatives' remains, so many bodies remained. A plaque commemorating the cemetery was erected and dedicated in 1992. Following the entry of Japan into the war and the threat of invasion, four anti-aircraft gun emplacements were established where the college buildings are now. During the war years the former cemetery became a camp used by the troops who manned the guns and was an important part of Fortress Fremantle for the defence of the port. The real beginnings of John Curtin College of the Arts occurred with the opening of the Fremantle Free Grammar School in 1856. This was a coeducational school which became Fremantle Boys' School and Princess May's Girls' School. In 1999, the Hon Colin Barnett, Minister for Education approved the proposal to establish a secondary school specialising in the Arts on the site occupied by John Curtin Senior High School. The college was to be a model for how Arts should be integrated into student's learning. In 2000, formal recognition of more than three decades of excellence in the Arts at John Curtin occurred with the re-badging of the school to John Curtin College of the Arts. This was the first step in the process of increasing specialisation for gifted and talented students. In 2004, the addition of a state-of-the-art performing arts facility was unveiled with the Curtin Theatre, the first building of its kind in a government school in this state. In 2008, the first intake of Year 8 students for Gifted and Talented Education Visual Arts and Music programs joined the existing Drama, Contemporary Dance, Ballet, Music Theatre and Artsmedia GATE programs at the college. With the majority of GATE arts programs of any school across the state, the college has been classified as one of only two selective public schools in Western Australia. John Curtin College of the Arts was chosen as a selective arts school due to its long and successful history of delivering quality arts programs. The cumulative outcome of teachers and students past and present, who have committed themselves to the achievement of excellence in the Arts at the college, means that today, John Curtin College of the Arts has a national and international reputation for achievement in Arts education and many of its graduates are prominent and successful artists on stage and screen around the world. The college was also chosen as it provides a specialised differentiated curriculum for gifted and talented Arts students and those identified as academically talented, providing them with opportunities for extension and enrichment. Students have the advantage of being able to interact with peers across the Arts, and work in an enriched Arts environment that provides extensive opportunities to learn.